November 15thmarks the date for the Great American Smokeout—an intervention event held by the American Cancer Society for the past 40 years. This event challenges people to commit to a smoke-free life by giving up smoking and tobacco products, or using the day to start making a plan to live smoke-free. It’s also a day dedicated for people to learn about the many resources and tools available to help people quit and then remain smoke-free. The Great American Smokeout is celebrated around the country as people change their attitudes about smoking, learn more about nicotine addiction, and take the crucial first step in quitting smoking. According to the American Cancer Society, smoking still remains the single largest preventable cause of death and illness in the world. More than 16 million Americans live with a smoking-related disease, and smoking causes 480,000 deaths a year. This means that 1 out of 5 deaths in the United States is directly caused by smoking. Smoking accounts for 29% of all cancer deaths and 80% of all lung cancer deaths, making it the leading cause of cancer death in the United States. Smoking can lead to other lung diseases that are just as harmful as cancer, such as chronic obstructive pulmonary disease (COPD). The practice also increases an individual’s chance of having a heart attack or a stroke. 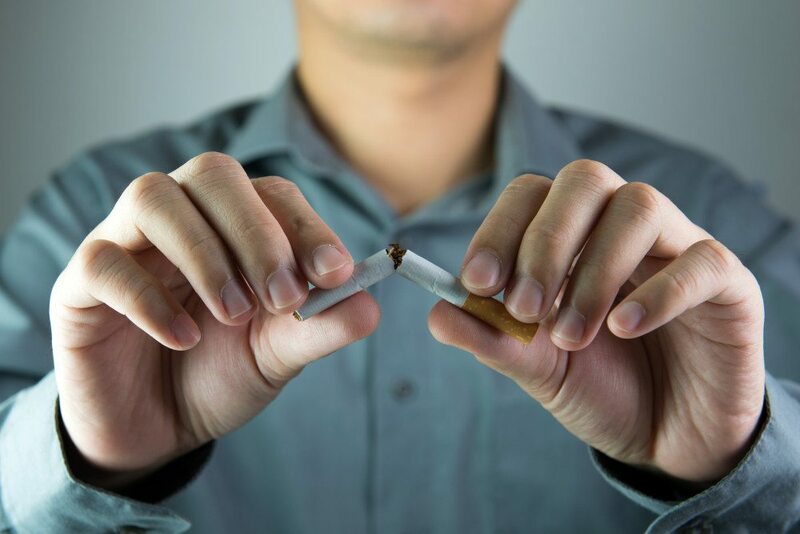 Other health problems caused by smoking include a decreased immune system function, premature skin aging, wounds taking longer to heal, an increased risk of gum disease and tooth loss, increased risk of type 2 diabetes, and increased risk of cataracts. Also, women who smoke may have a more difficult time getting pregnant. The sooner you start living smoke-free, the more you can reduce the effects of these smoking-related health problems.According to the American Cancer Society, quitting smoking before the age of 40 reduces the risk of dying from smoking-related disease by about 90%. It’s never too late to quit smoking—quitting while you’re younger will reduce your health risks more, but quitting at any age can give back years of life that would be lost by continuing to smoke. Just a few months after quitting, circulation and lung function improves, and coughing and shortness of breath decreases. After a year, the risk of having a heart attack decreases drastically and after five years, the risk of getting cancer decreases. Fifteen years after quitting smoking, your risk of developing coronary heart disease is the same as a non-smoker. The Great American Smokeout is an annual event that creates an opportunity for the 38 million Americans that still smoke cigarettes to make a lifestyle change that will last. Research shows that the chances of quitting smoking successful almost triple when you are provided with outside help and support. The American Cancer Society strongly advises smokers to consult a doctor or pharmacist and to use proven cessation methods such as prescription medications and counseling. The following cessation methods are recommended by the American Cancer Society, but professional guidance can help you choose the best approach for you. Using two or more of these methods at a time is more effective than just one. The American Cancer Society is available 24 hours a day, 7 days a week to provide support and can respond to questions about quitting smoking to looking for national or local resources to help you quit. For more information on the Great American Smokeout and available resources, visit the American Cancer Society’s website at www.cancer.orgor call toll-free at 1-800-227-2345.